Autumn has officially arrived and it's the time to enjoy all that it has to offer. Farmer markets, vegetable stands, and grocery stores are filled with sales from the Canadian Harvest with food bounty. Bushels and baskets of various colours adorn our food places and tempt us with their nourishment and flavours. The colours provide a perfect palette of hues for perfect photo compositions. 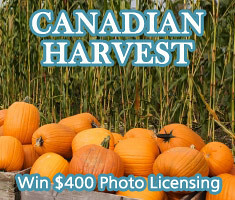 Lenzr has a new photo contest centering on the Canadian Harvest. They are asking for photos that celebrate this Harvest season. Perfect for this time of year to take a basket of bounty that asks to be enjoyed visually. Before you dive into those delicious tomotoes, carrots, peaches or apples grab your camera and play with the light and composition with different angles. Get that perfect award winning picture. This is a chance to enter your photos for free and the Lenzr judge could decide you have the best photo. The prize winner will receive a $400 dollar photo license for use of your photo from a brand personality consultant. Get exposure for your photography and add it to your portfolio or resume. This Brand Personality Consultant loves the art of photography and the Canadian Harvest. The contest started September 1, and runs till November. Upload your photos for free. Let's see those colourful and amazing Canadian Harvest Bounty images.